Stephen vs. Danny: We Won! 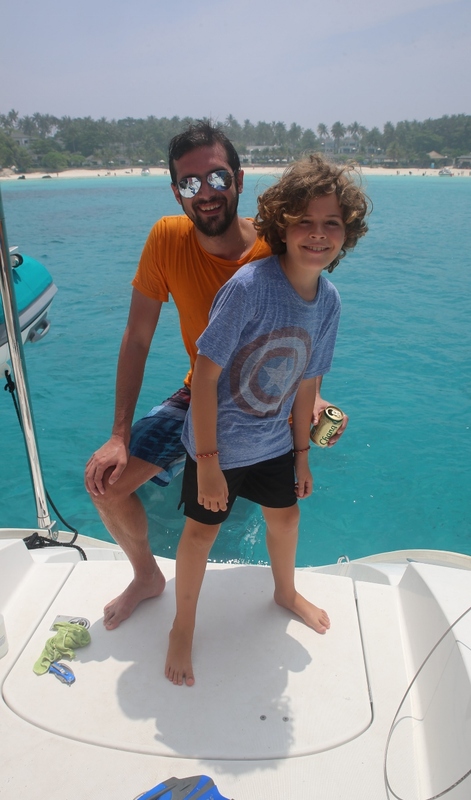 I wrote a blog back in August about the friendly rivalry between my nephews Stephen and Danny about who was going to have the best Sophie Adventure Cruise. Stephen joined us for 3 weeks in August for a visit that was epic. His younger brother Dan joined us for a 2 week visit in October that turned out to be equally epic. The real winners of this contest? Me, Jenna, Leo, and Hazel. We had the pleasure of sharing our home for almost 2 months with family members who were a lot of fun AND served as excellent role models for their younger cousins. Well, at least for most of the time. 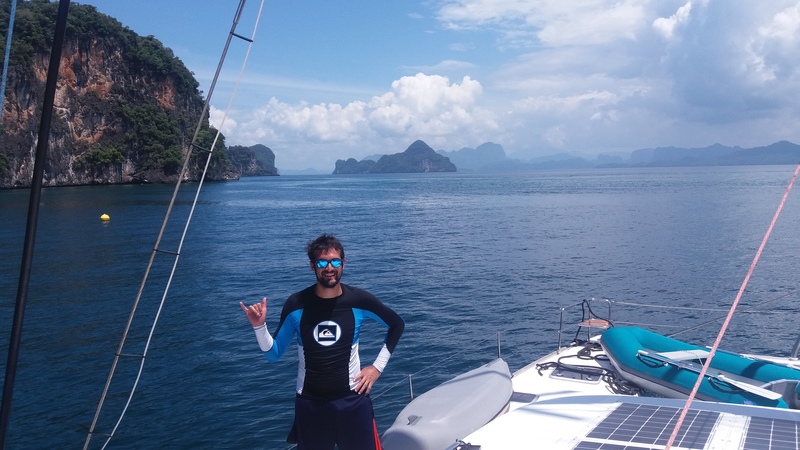 “DanDaMan” arrived on flights from Switzerland on the evening of October 1, and we set out the next day on for the same basic loop around the “Dandaman” Sea that we took Stephen: Koh Racha, Koh Phi Phi, Krabi, and Koh Hong. Unfortunately, when Dan landed the entire Phuket area was blanketed with smoke from the Sumatra palm oil fires that are plaguing the area, limiting our visibility. We also got off to a late start and tucked into the Chalong anchorage for our first night. The next morning headed down to Koh Rocha and grabbed the mooring on the west side anchorage, only to discover that the bar on the rocks overlooking the beach that Stephen and I enjoyed so much had been razed. So we went around the corner to Racha’s east coast to visit “Beer Beach”, which turned out to be a charmless wasteland of multiple tourist boats, small amounts of beach, and even smaller amounts of beer. 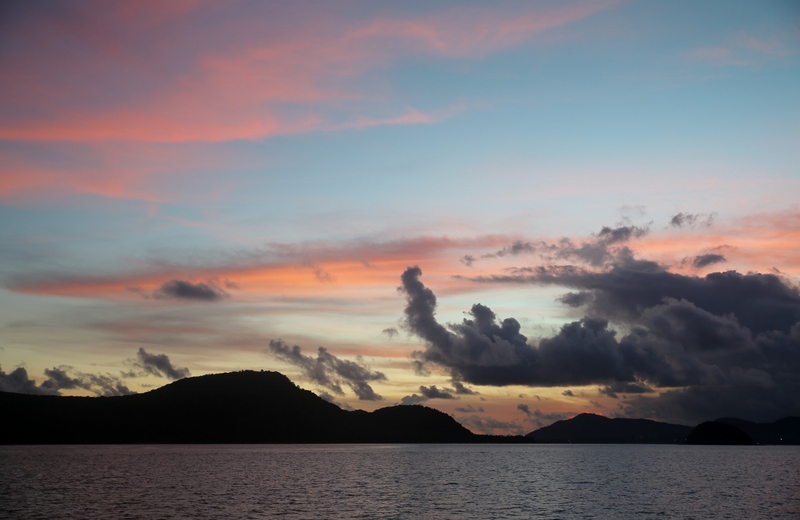 So we decided to ditch Koh Racha altogether and head over to Koh Phi Phi. 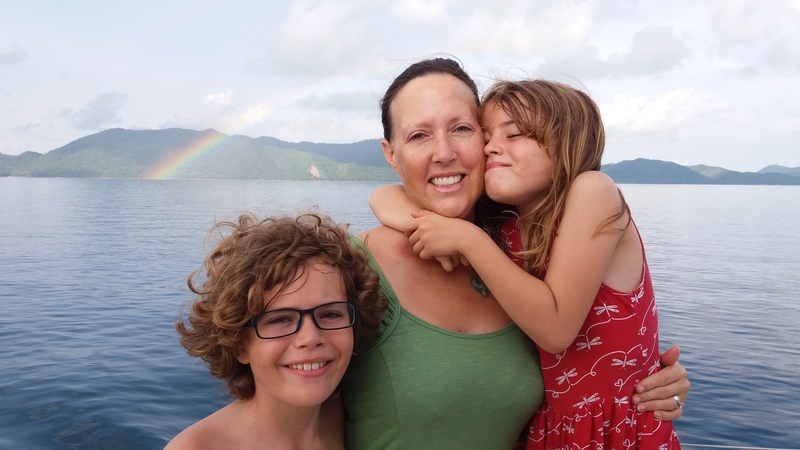 We spent a night anchored off Jasmin Restaurant, and then spent a week at Monkey Beach. 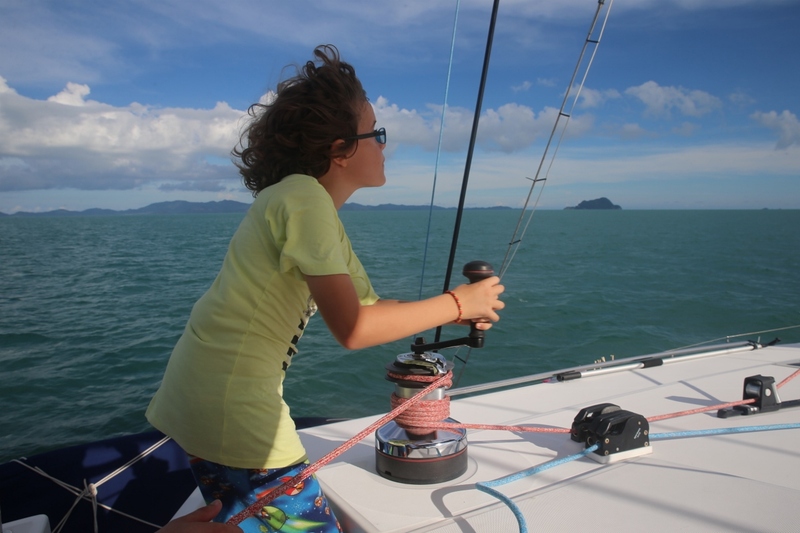 One day we took the big dinghy and bombed the five miles over to Phi Phi Le, with a first stop at Maya Beach. Upon arrival, the kiddies were thrilled to discover that Dan had a big rip in the seat of his swim shorts. 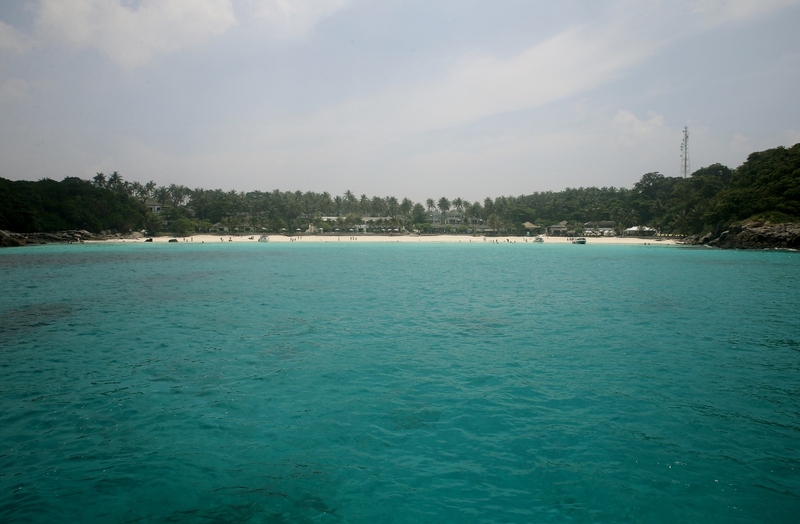 Dan was able to successfully manage the situation and enjoyed the spectacle of the hundreds of boats and thousands of tourists that crowd into this little beach. After Maya Beach, we bombed around to the east side of Phi Phi Le and dropped a hook in the middle of the floating party boats. The boat next to us had 40 backpackers on board, and the owner gave each of them a tallboy can of Chang Beer that they all took into the water. They floated together in a little group, sipping their beers, as the owner then climbed 50 feet up the cliff on the side of the hong and did a magnificent backflip in front of the assembled fleet. It was pretty cool. When Stephen was with us, we became friends with some backpackers on Phi Phi. Actually, it was Hazel who made the initial connection. Adz and Audrey were playing Frisbee on the beach at Phi Phi at low tide, and Hazel worked her way into their game. An hour later they joined us for a drink at the beachside restaurant where we were hanging out. Adz is a tattoo artist, and he swung by later that evening to check out the situation while Stephen and I were getting out tattoos. He thought the local guy was doing a good job and was inking clean lines. 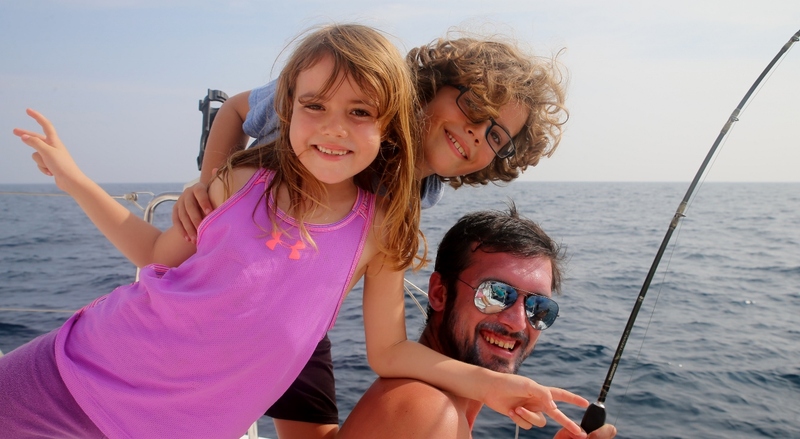 We wound up inviting Adz and Audrey for a ride back to Phuket on Sophie, and they accepted and even spent a night on board. 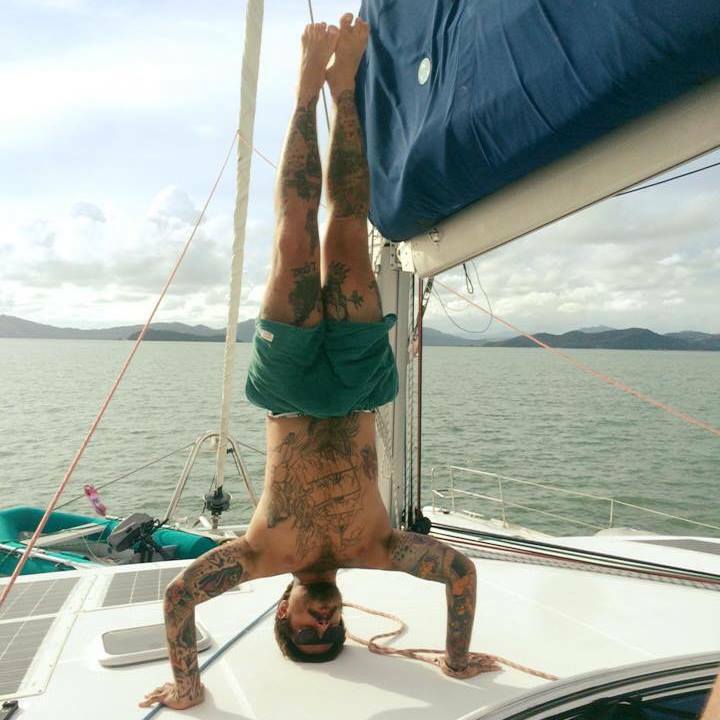 Adz was so happy at one point that he did a headstand. We became friends with some backpackers while Danny was with us in Phi Phi as well, but this story is a bit more of a caper. Unfortunately, Leo woke up one morning feeling sick to his stomach, and Jenna suggested that Dan and I head into town to pick up some ginger ale and some beer (we were out.) Since Dan was on vacation, we also thought it would make sense if we stopped for a bite to eat. So we took the big dinghy over to the Rolling Stoned beach bar for a quick beer. 10 beers and one AWFUL hamburger later, we left and got the ginger ale and beer. As we walked across the low tide beach to the dinghy, Dan begged if we could join the pickup soccer game. We did, and we were terrible. We got in the dinghy and drove back to Sophie, where Jenna pointed out we had no beer or ginger ale with us. We had left them on the beach! So we went back to Phi Phi, reloaded our drink bag, got into the dinghy, and then encountered a group of American kids hanging out in the water having fun and drinking beer. 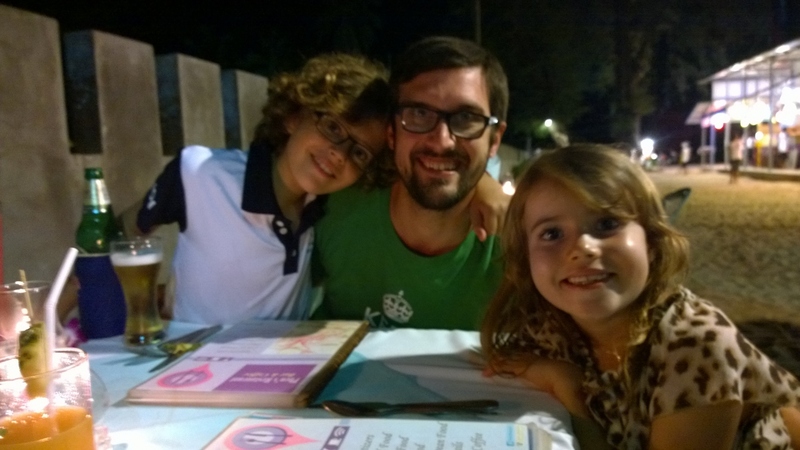 They seemed like our kind of people, so Danny and I invited them back to Sophie. After a little bit of consideration, they agreed, and Ella, Kevin, Maggie, Anna, and Shannon joined for a few hours on Monkey Beach. 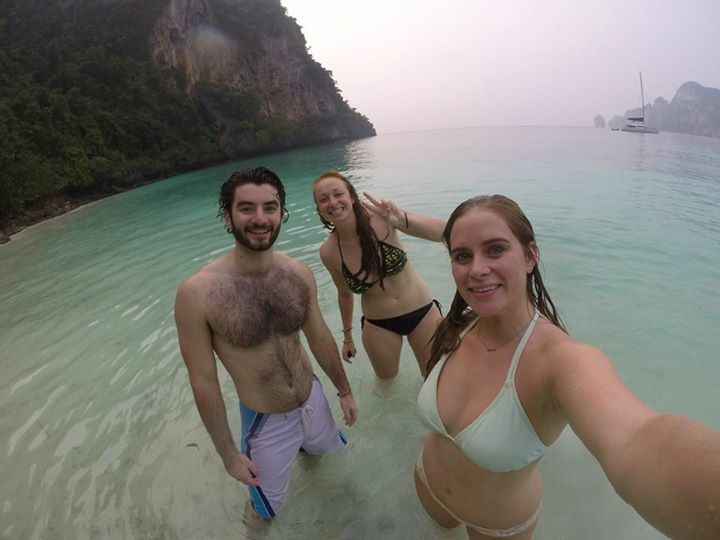 They had all recently graduated form Loyola Marymount University in Baltimore (which means they were Jesuit-trained, like me) and were taking the smart step of backpacking across Thailand before getting on with their careers and the rest of their lives. We hung out in the water for a few hours and had a great time, except that Kevin got bit by a monkey (it didn’t break his skin), I discovered that the new dinghy wouldn’t plane with 7 adults on board (which really bummed me out), and Jenna was so busy taking care of Leo that she never got her beer (she is a loving mother with incredible patience.) But we made some new friends and have a new story to tell. Also, as you can see from the photo, the Sumatra smoke was still with us. 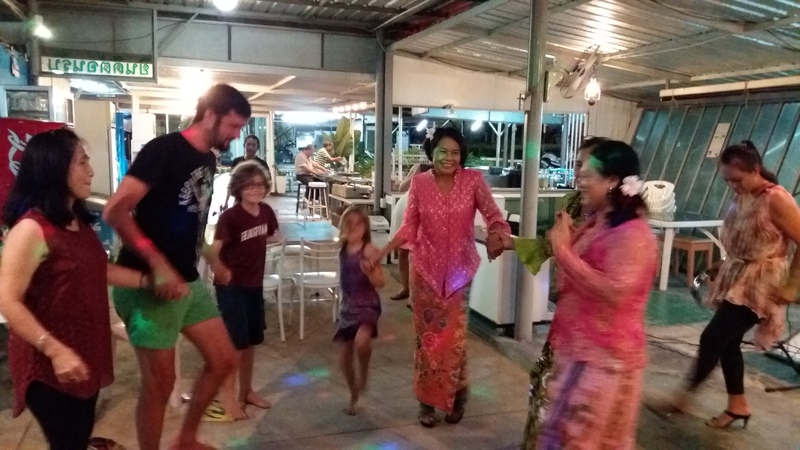 After a week in Phi Phi we headed up to Krabi to stock up on fresh produce and sing some karaoke at the Krabi River Marina. I got a haircut, and we took Dan to the wet market, the night market, the local temple, and to some of our favorite haunts. For karaoke, Dan opened the night with “Like a Virgin” which for some reason didn’t go over super-well with the local Thai crowd. The mike was passed to a group of ladies celebrating at a corner table, and we never got it back for the rest of the night. They did let Dan and his cousins dance with them, though. 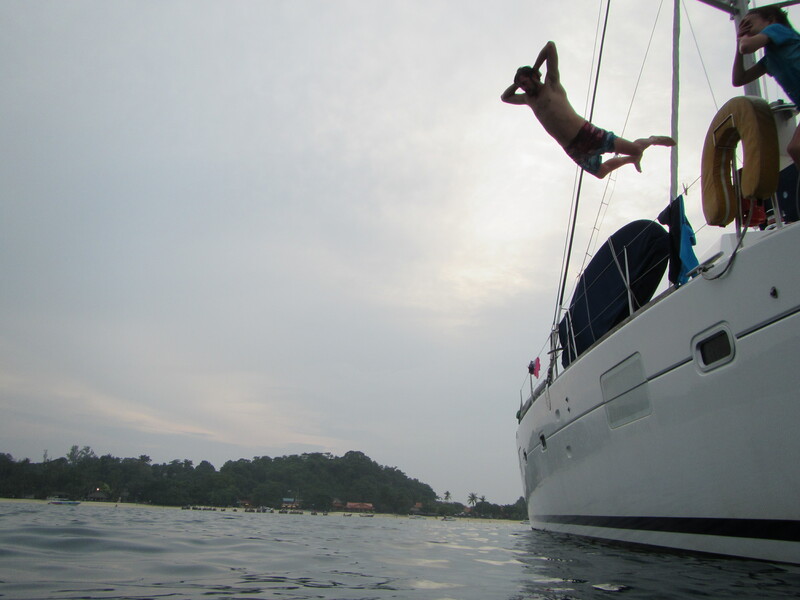 After Krabi, we took Dan up to Koh Hong and grabbed a mooring on the south side off the national park beach. The Sumatra smoke had cleared, and Dan finally got some sunny weather with spectacular views. We took him into the beach, where he discovered that the fishies love themselves some Hazel. But all good things, including Dan’s visit, must sometimes come to an end. Which means we couldn’t convince him to stay another a week. So after Koh Hong, we headed back to the Yacht Haven Marina in northern Phuket for one last meal with some of our cruising friends. 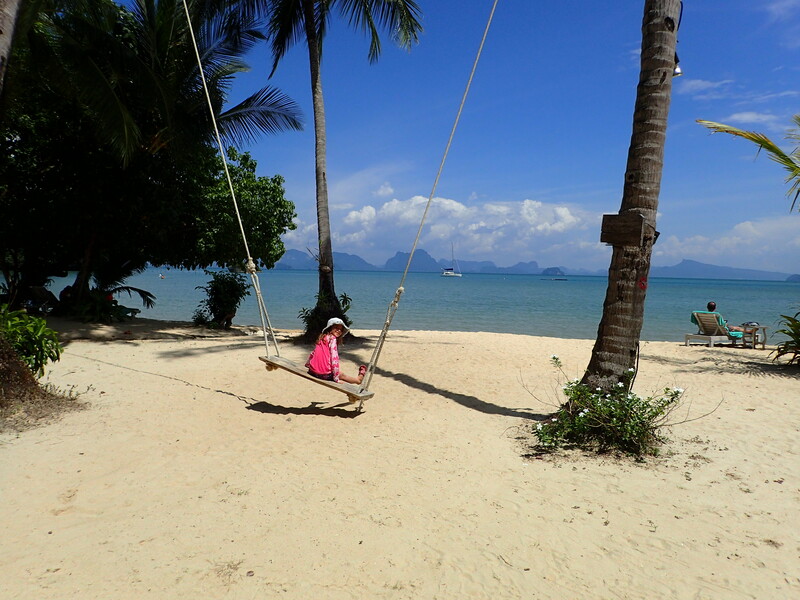 On the way we stopped for lunch at the Paradise Resort on Koh Yao Noi. Hazel likes the big swing there. Dan’s flight left at 8:00 PM the next day, so we had the opportunity to spend a last day exploring Phuket with him. We headed down to the Tree House Restaurant, where we had once taken Stephen, for lunch. Unfortunately it was closed. Jenna still hasn’t eaten there. So we instead headed all the way down to Chalong for a waterfront meal at Dickie’s Lighthouse. 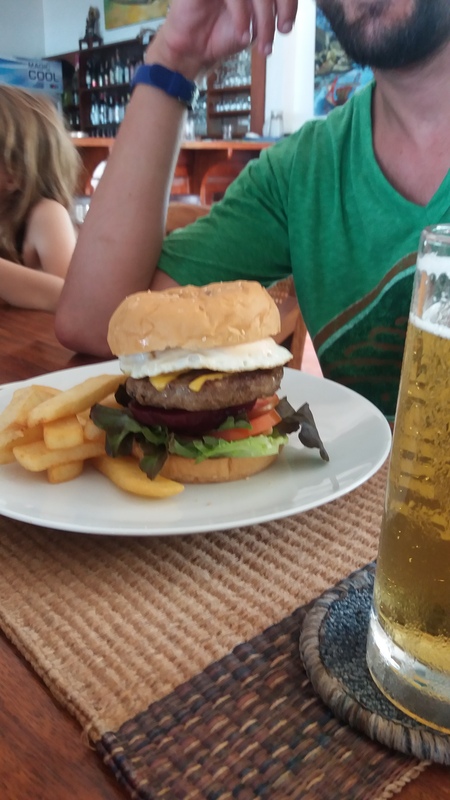 Dan enjoyed his last meal in Thailand. Unfortunately for me, I’ve been SUCH a good host for my nephews during their 5 weeks here that I’ve been eating and drinking this way during their entire visits. We’ve gone on a bit of a cleanse now before we host our next Adventure Cruise in November. 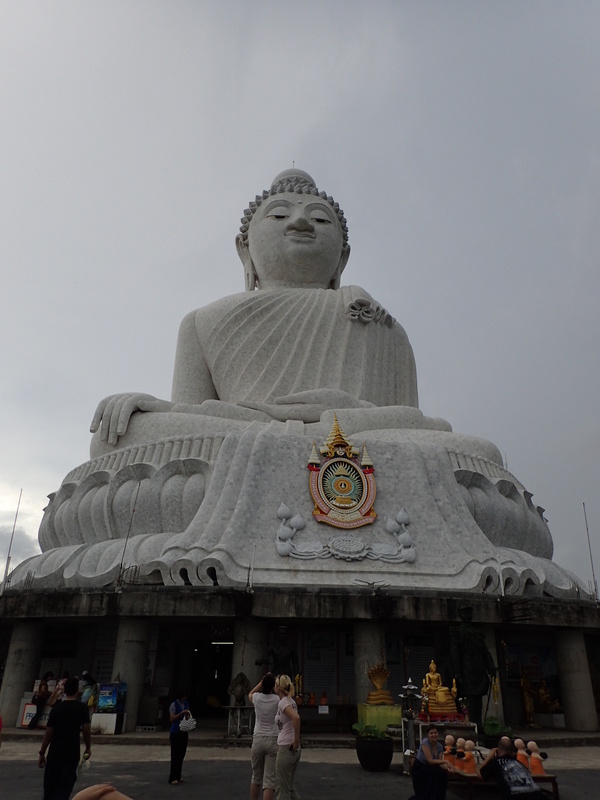 After lunch, we decided to drive up the hill and visit the Big Buddha statue that dominates southern Phuket. We’ve seen it from a distance dozens of times but never bothered to visit. What a mistake! 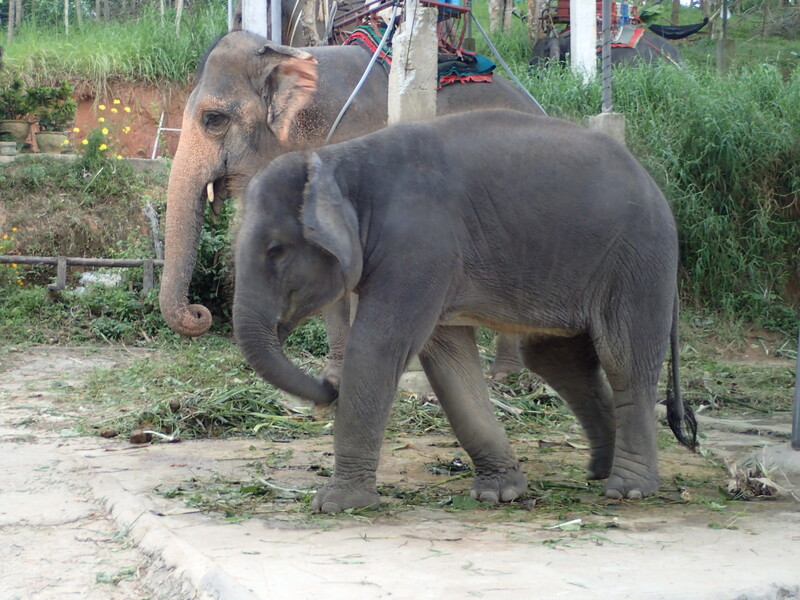 For starters, we passed multiple concessions that will take tourists on elephant rides, and they all have baby elephants out by the road. You can never see too many baby elephants! At the top, there is a huge statue of Buddha that also serves as a temple, with monks inside singing prayers. If you turn your back on the temple, you can look out and see the “Dandaman Sea” and the loop we took over the last ten days with Dan. It was a great way to end his visit. After the Big Buddha, we drove up Phuket’s west coast for one last sunset beach beer and then sadly dropped Dan off at the airport. 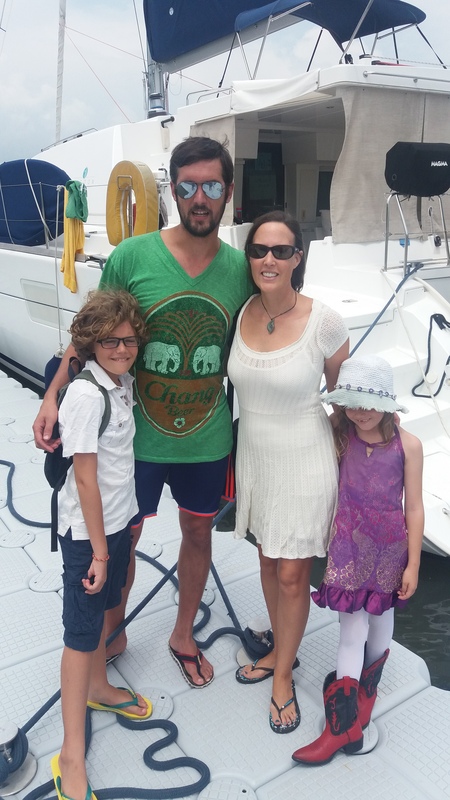 It was the end of two great visits that in our minds and hearts blended into one extended family fest, which is something that is especially important for Leo and Hazel as they continue to explore the other side of the world from where the rest of their family lives. Stephen and Daniel, thanks for the visits. We had a great time. Everybody is a winner! 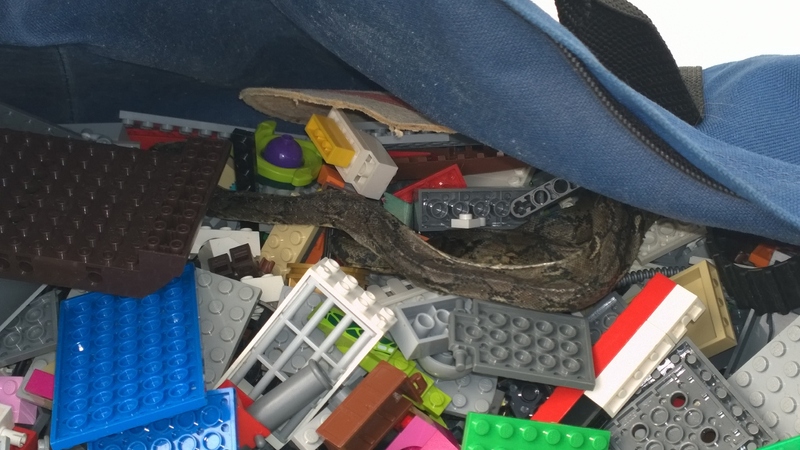 Snake in the Lego Bag! What started as a calm and typical Sophie School day turned alarming when Leo ran up from his room screaming that there was a snake in his Lego bag! Leo has a huge collection of Legos, and for the past couple months we had been storing his suitcase sized canvas Lego duffle bags in the generator compartment next to our bikes. During a short school break, Leo retrieved the biggest Lego bag and brought it to his room to play. As he unzipped the bag and reached in, he noticed a terrible smell, and then his hand touched something that wasn’t a Lego piece. At first he thought it was a toy snake, but then to his horror realized it was real! Real and big! Completely terrified, Leo ran upstairs to me and Hazel, screaming about the snake. Jamie was on shore running errands. Good times! Our initial concern was whether the snake was alive or dead. As I comforted Leo, a flurry of thoughts rushed through my head. Several of our friends have experienced snake visits to their boats within the last few months. Vipers and pythons, oh my! What could be slithering around in his room? 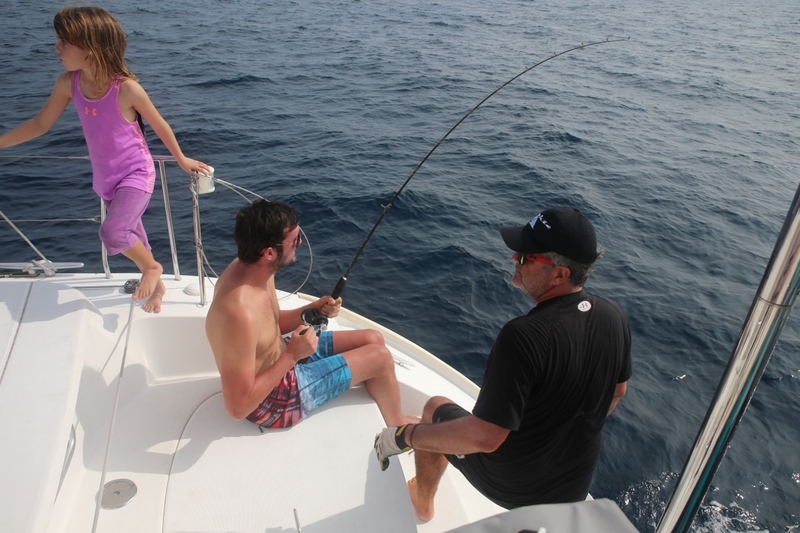 Then, I realized there was an overwhelming dead animal smell coming through the boat. Leo thought the snake was dead, but it took a minute for him to feel certain about this and I didn’t want to let him back in his room with a live snake. After peeking in to check that the snake was still motionless in the bag, Leo carried the duffel outside and dropped it on the deck. The kids and I got a much better view in the sunlight. Definitely dead. It was still coiled up and I couldn’t tell how long it was, but this was not a little sea snake like the ones we’ve seen while swimming in the Pacific and Southeast Asia. The markings looked like a python to me. A python?!? In my child’s Lego bag!?! I felt sick. Next, Leo thumbed through his army survival manual while I searched online. The closest matches were images of pythons and the other common snakes of Thailand looked quite different. Ok, python it is. But how did it get into the bag? How long was it in there? How did it get zipped in? Where did it come from? When did it slither onto Sophie? How many times had we been in the generator compartment during the last month? How many times had we lifted those Lego bags in and out of the compartment to get bikes out, access LPG bottles, do generator maintenance, etc.? Jamie can spends hours at a time in there working on the electronics or genet. Thank goodness Leo had been doing a big push on school this month and had taken a Lego break or chances are he might have opened that bag days earlier and… no, I can’t even. On deck wasn’t far enough away from the smell, so we threw the bag onto the dock. When Jamie returned, he pulled the snake out using fishing pliers and we got our first look at the entire creature. 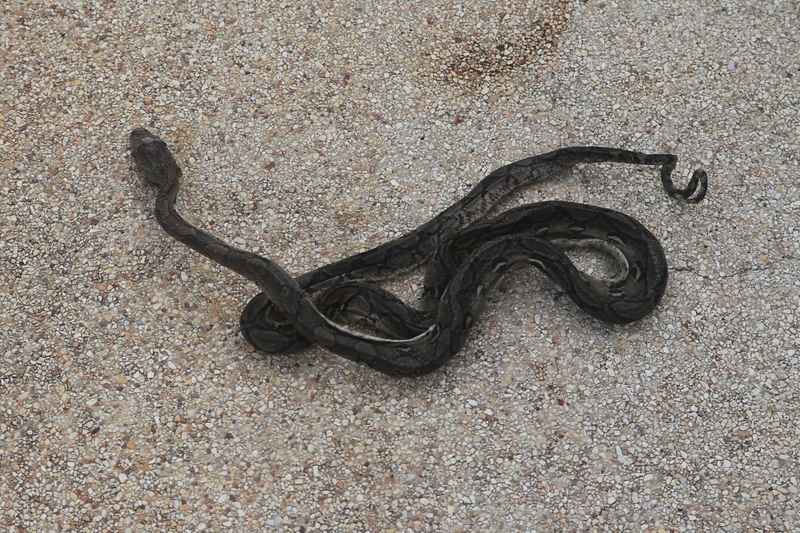 The snake was about five feet long and dried. It must have been in that bag for a while. There was a snakeskin in there too. We may have picked it up in Malaysia. Who knows? We have no idea exactly when or where the snake boarded Sophie or which one of us zipped it into the bag, or whether there was a small enough opening by the end of the zipper for it to get in but not back out. We were all pretty shaken from the thought of a snake crawling around our home, but very thankful we never saw the live version. Jamie was kind enough to dispose of it all. Leo is mourning the loss of half his Lego collection, but there was no way we were keeping any of it. We have also carefully inspected Sophie and believe there are no other snakes lurking. We feel quite relieved, but remain vigilant. Our mood changed quickly following this unpleasant event, with the arrival of our nephew Danny that night. The kids love having another cousin visit, and we are back in prime cruising form with all the new upgrades on Sophie. 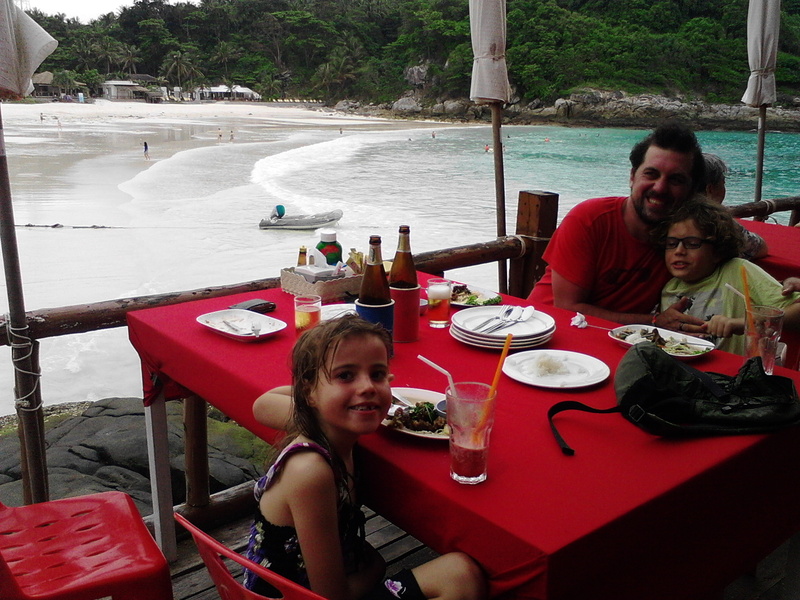 We started out with dinner at the same beach restaurant where we took Danny’s brother Stephen last month. 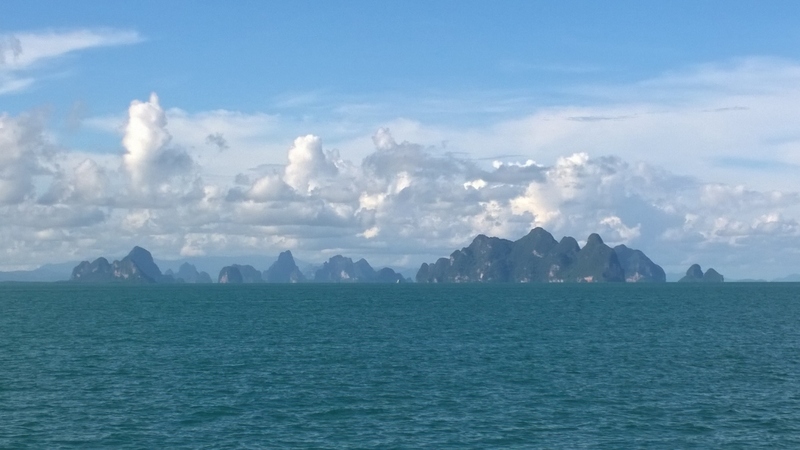 We even got a break from all the Sumatran smoke for Danny’s first day out on the water, with spectacular views across Phang Nga Bay. 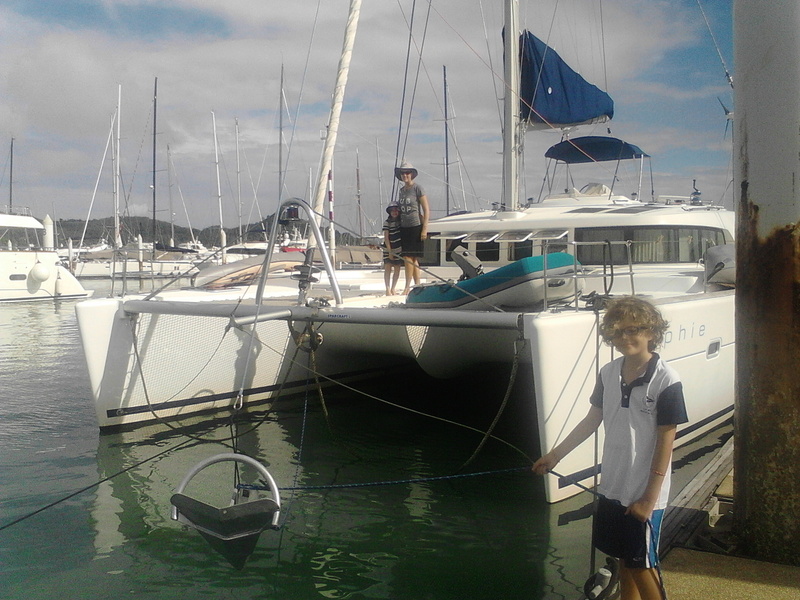 Leo winched the jib out manually for an afternoon sail. 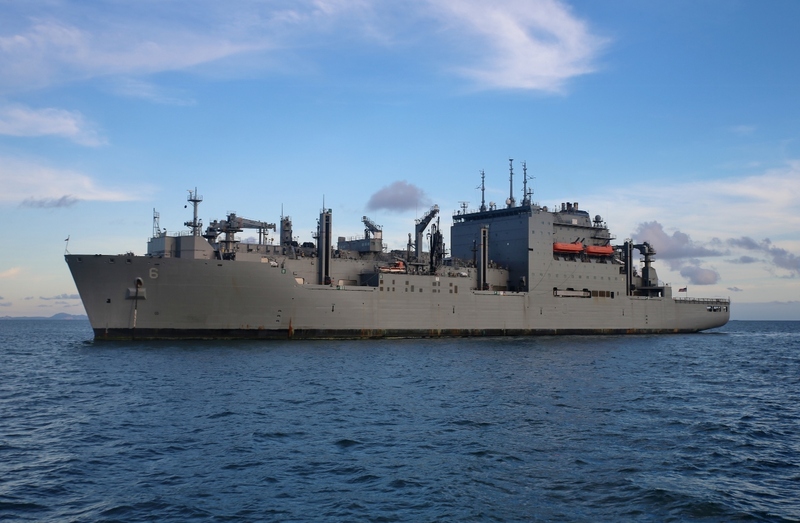 That morning, Hazel had written a letter for school about Amelia Earhart and was thrilled when we sailed past the USNS Amelia Earhart anchored outside Chalong Harbor. A total coincidence, we had no idea it was there. Jamie hailed them on the radio to thank them for their service and share the story about Hazel’s project. 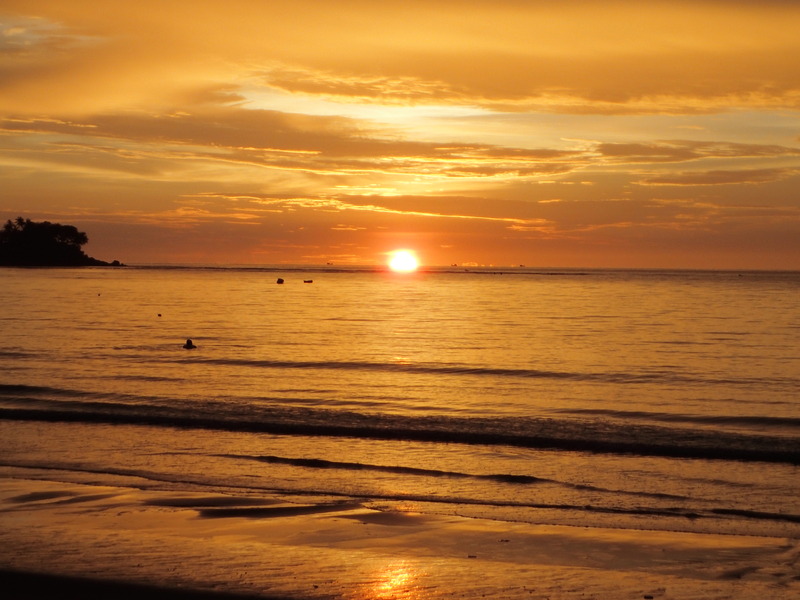 We stopped for the night around the corner and enjoyed a quick swim just before sunset. 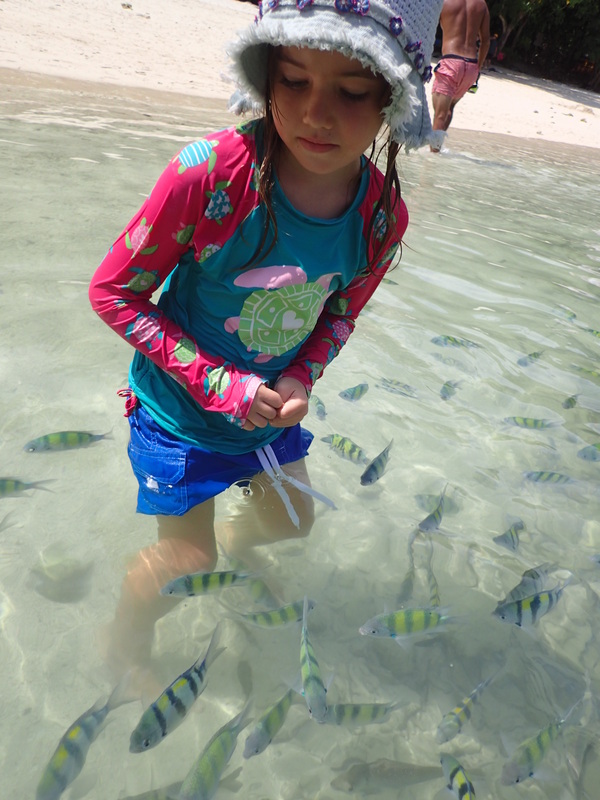 The next morning, we motored to Racha, where we stopped for some snorkeling and hull cleaning. It’s hard to tell from the photos, but we only had about two miles visibility on the way from all the smoke in the air from the Sumatran fires. The beach bar at Racha had been torn down since Jamie and the kids were there with Stephen last month, and the wind was picking up from the west, so we decided to move to Beer Beach on the other side of the island. That turned out to be an overcrowded tourist boat day stop, so after a quick dinghy recon mission, we departed for Koh Phi Phi and dinner at Jasmine’s. 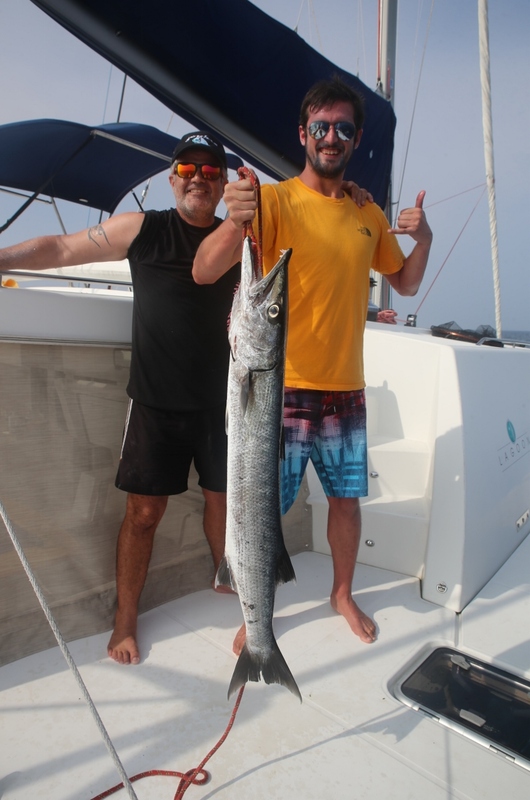 On the way, Danny caught a big barracuda in the “Dandaman” Sea, our first large fish in a long time. Mojitos, Thai food, pizza, Settlers of Catan, beaches, snorkeling, kayaking and lots of swimming and diving are on the menu this week, and there hasn’t been a snake in sight. We still aren’t feeling very motivated to play with Lego yet, but we do feel very lucky. Here’s a quick update on Sophie’s ongoing Thai makeover. 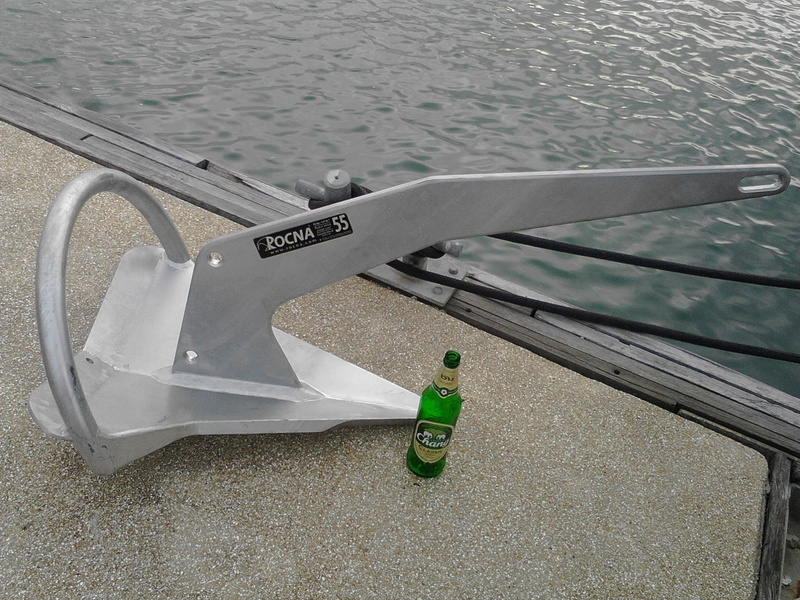 Earlier this week, we replaced our old Lewmar “plow” style anchor with a new Rocna anchor. 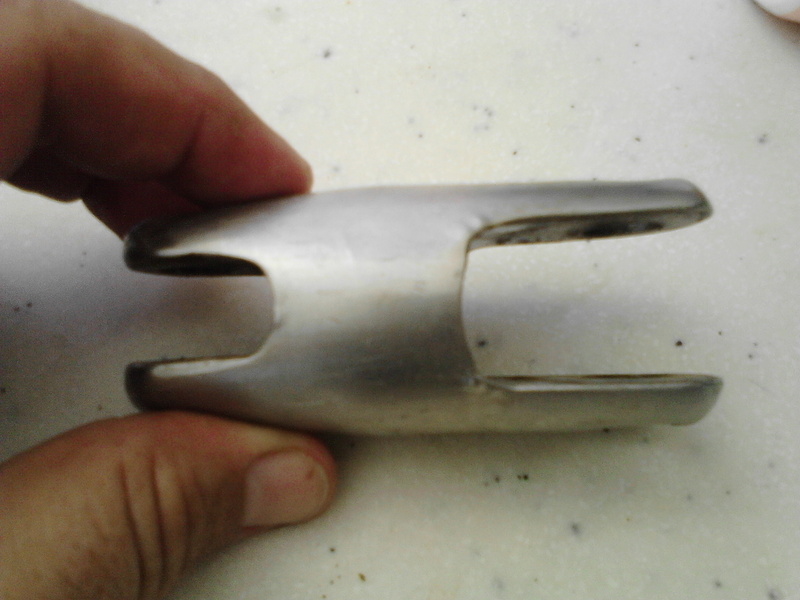 Rocnas are made in New Zealand and are considered by many cruisers to be the finest anchors in the world. 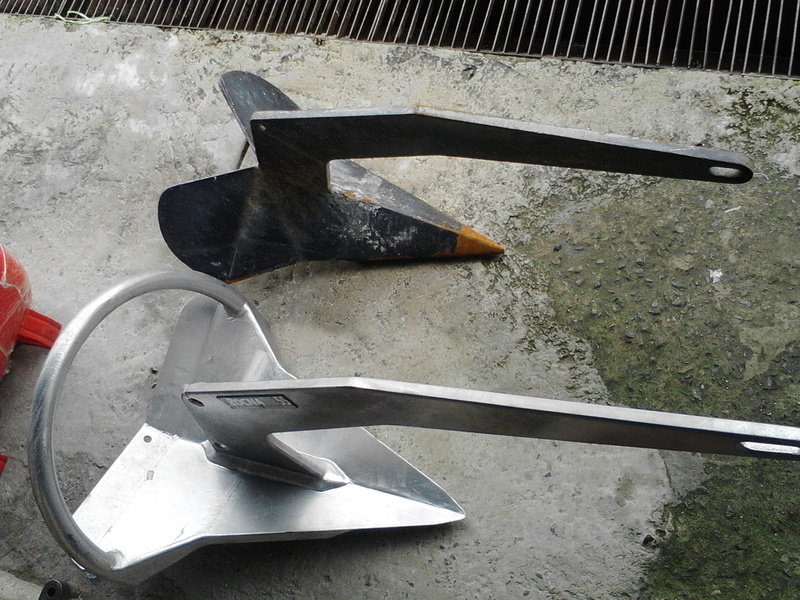 Our Lewmar anchor weighed 40 kg and came with Sophie when we bought the boat in 2008. Overall it has served us well, but we’ve dragged our anchor several times in the last 5 months, so Jenna and I thought it was time for a change. The Rocna weighs 55 kg, has a bigger spade to bite into the ocean floor, and features a roll bar that helps keep it set. As you can see, the new anchor is significantly larger than this .5 liter beer bottle. Our nephew Dan, who has joined us for a 12 day Sophie Adventure Cruise, was kind enough to point out that the beer bottle is empty. Getting the Rocna onto Sophie required choreography and teamwork. We used four ropes and it all worked perfectly. There was no shouting. Just smiles. The new anchor makes us happy. 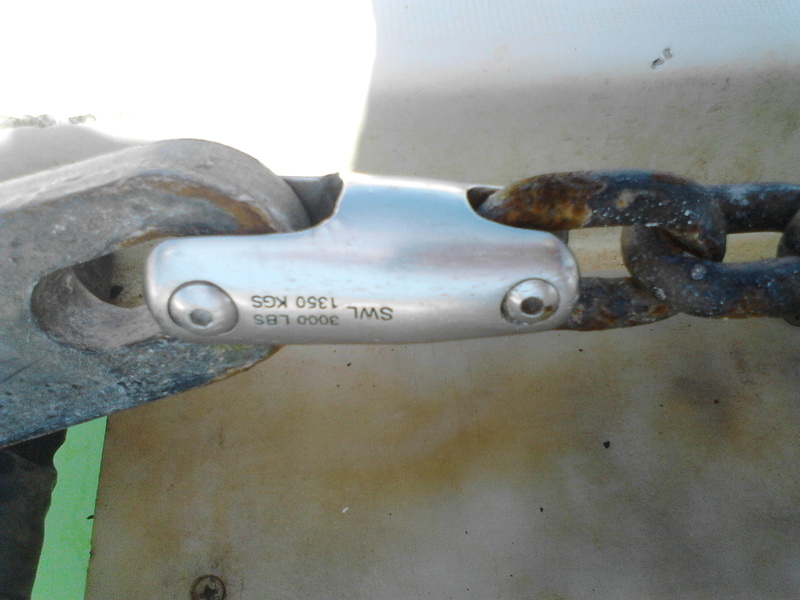 Our old anchor was attached to the anchor chain with an inline stainless steel fitting. 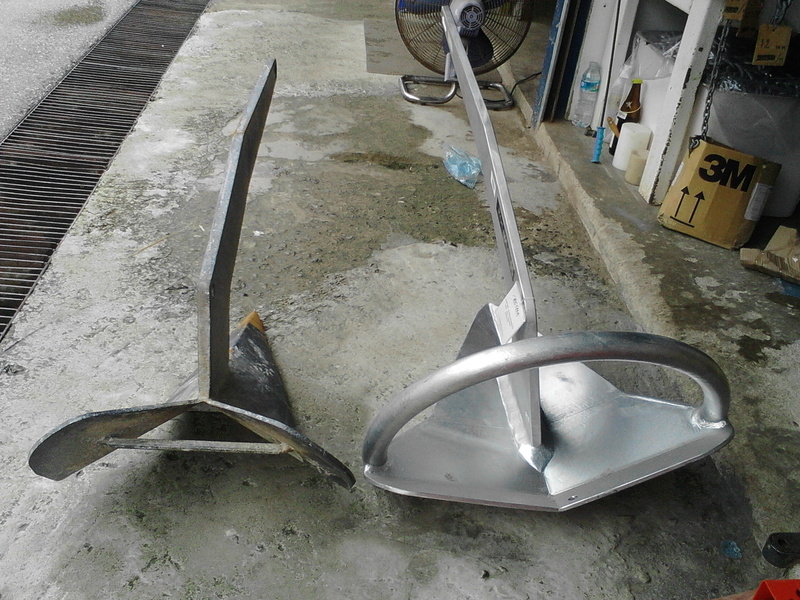 Many sailors do not like this kind of attachment because side pressure could potentially cause the stainless steel to bend and eventually break. 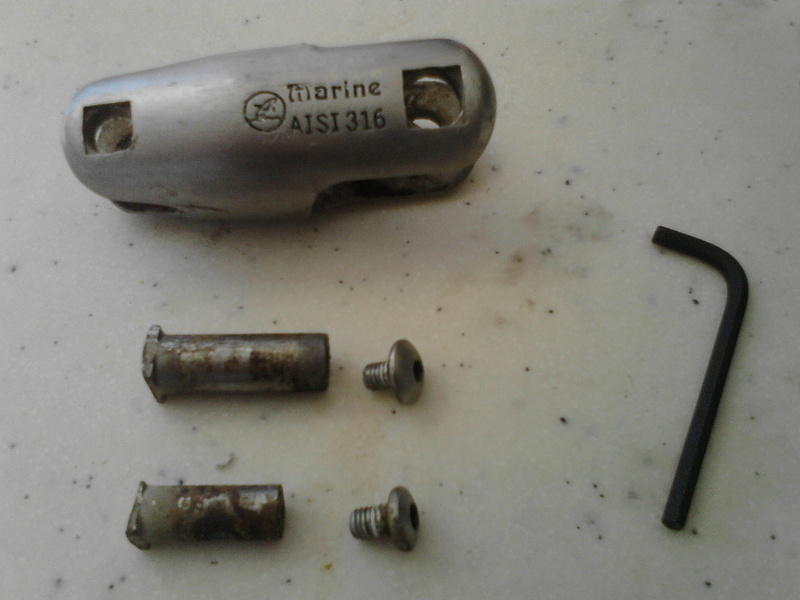 In fact, we have a friend in Seattle who recently purchased a new sailboat, and he spent a week trying to remove this type of fitting from his anchor. Our’s came off in three minutes, which is pretty cool given that it has been in use for 7 and a half years. As you can see, there is no bend to our fitting. We are using a simple shackle to attach the Rocna to our anchor chain. Rocna has an excellent anchoring knowledgebase on their website, and they recommend using this approach. 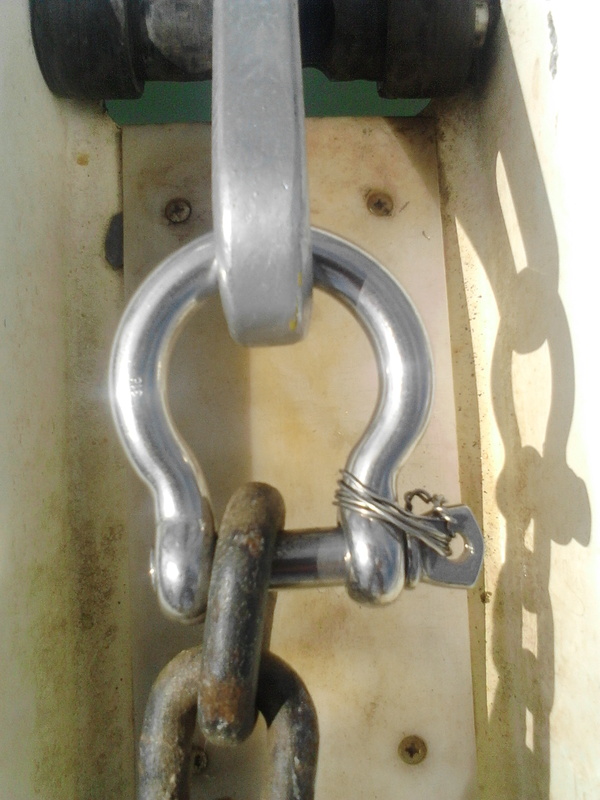 We replaced our anchor bridle, the 2 ropes that we clip on to the anchor chain once it has set. 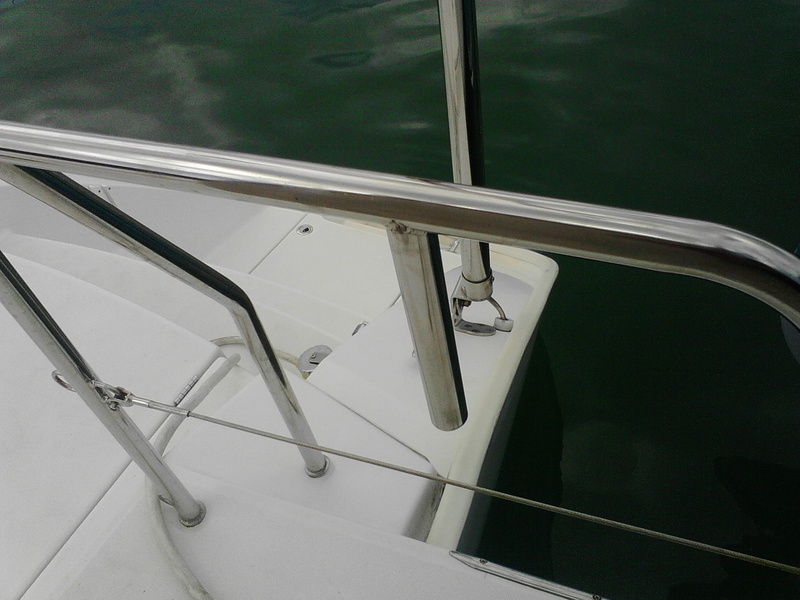 The bridle acts as a shock absorber and distributes the load from the anchor to each hull. The old bridle was hard and calcified, covered with dead barnacles and other marine mysteries. 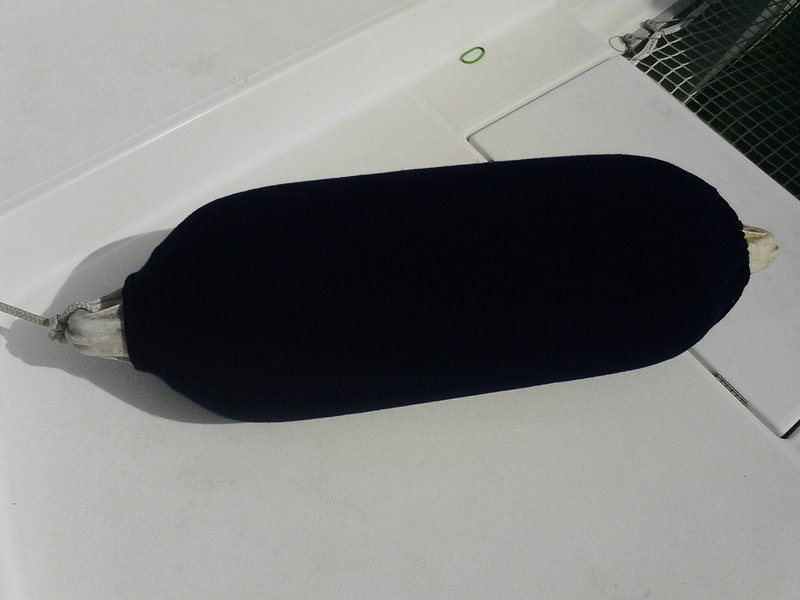 The new bridle is soft and shiny. We also bought a completely new anchor chain. We won’t replace the chain until we haul Sophie out of the water for bottom painting in December. Between the new anchor and chain, we hope to have worry-free nights for years to come. We’ve had some other work done in Thailand this past week. Sophie has a wooden seat on each bow pulpit. 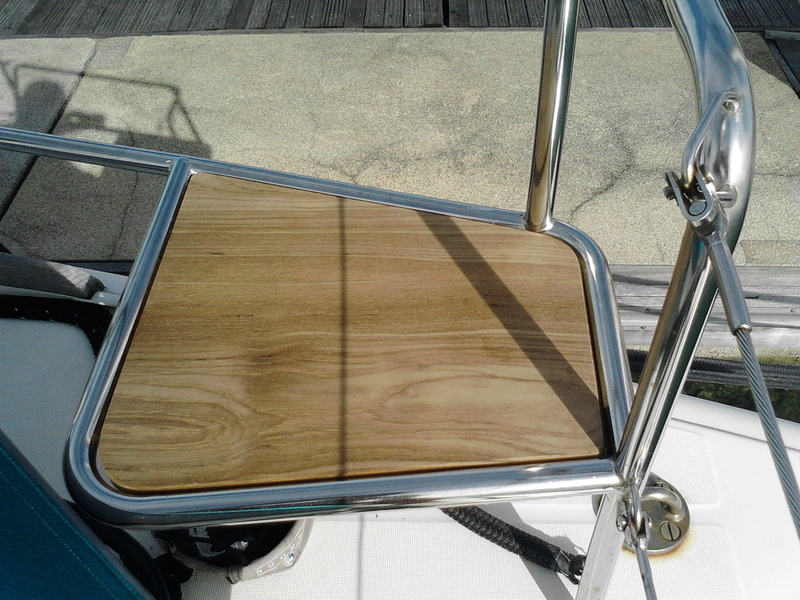 The original seats were made from marine plywood and were beginning to delaminate. 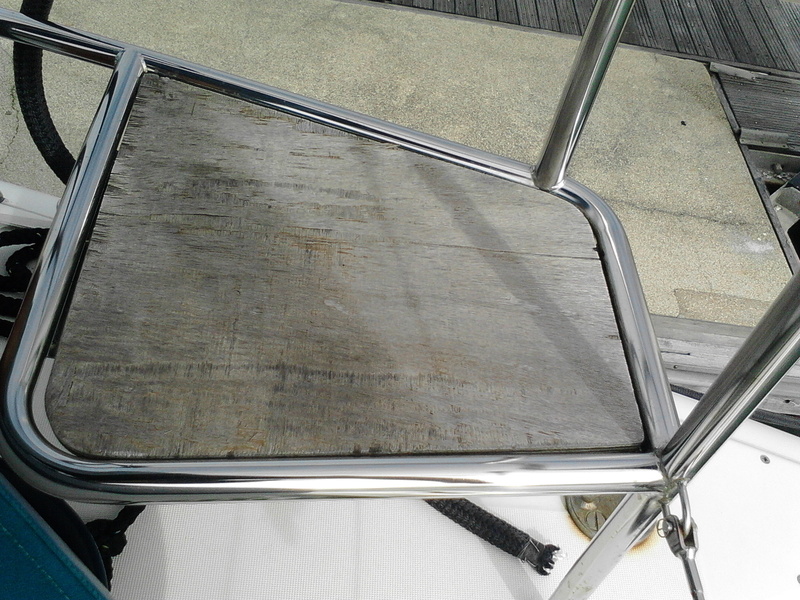 We replaced them with solid teak. They are now too nice to sit on. We installed a West Marine plastic engine mount on one of our stern pulpits for the engine to our small dinghy, The Baby. The mount is designed to attach to the pulpit where a horizontal tube and a vertical tube meet to form a “T”. We didn’t have one of those, so we asked a local guy to make one for us by welding a new piece of stainless steel to our pulpit. 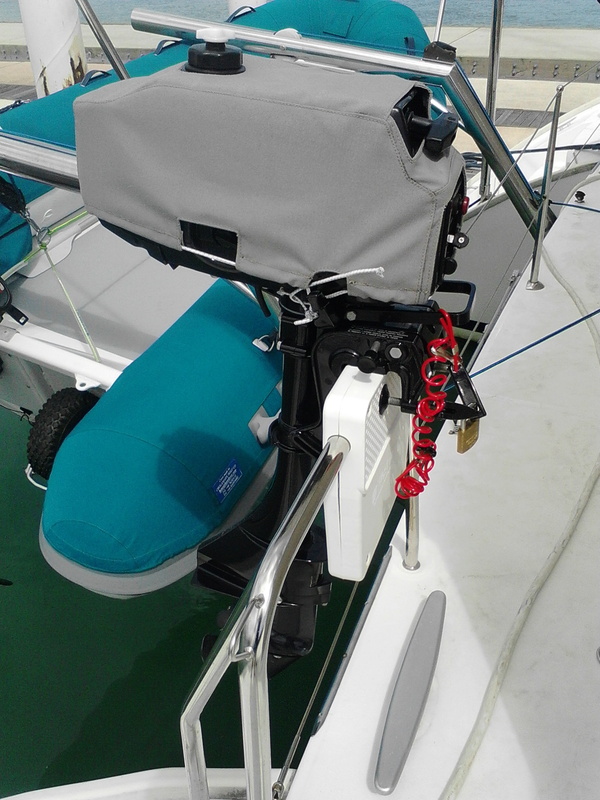 We had the local rigger Rolly Tasker make a custom bridle for our big dinghy, making it easy for us to raise the dingy out of the water using our stern dinghy davits. The bridle is made from 10 mm Dyneema cored rope. 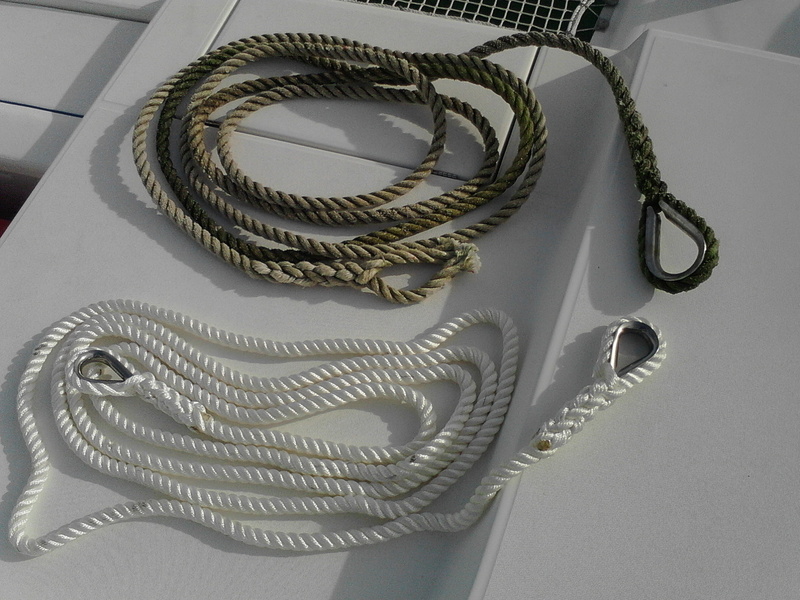 We also replaced the dinghy davit ropes with Dyneema as well. 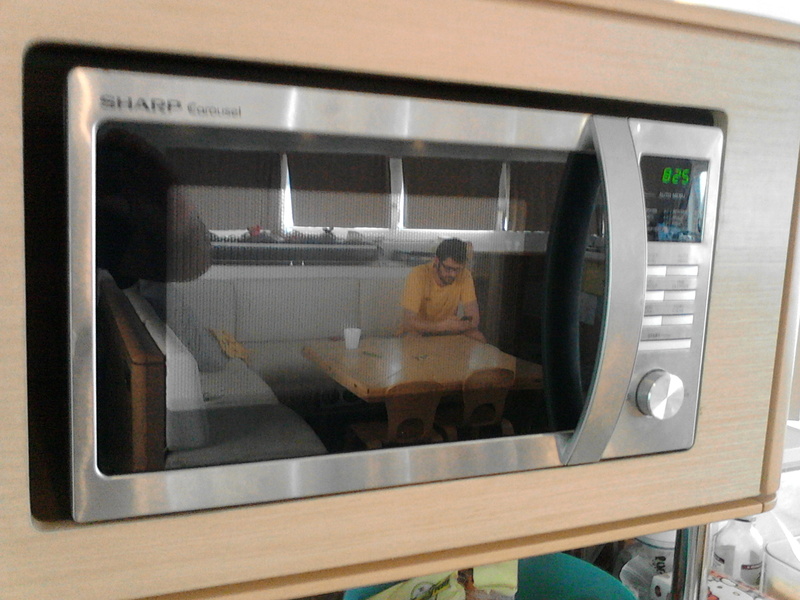 Our microwave oven bit the dust 2 months ago, and Jenna brought one back from the US with her in August. 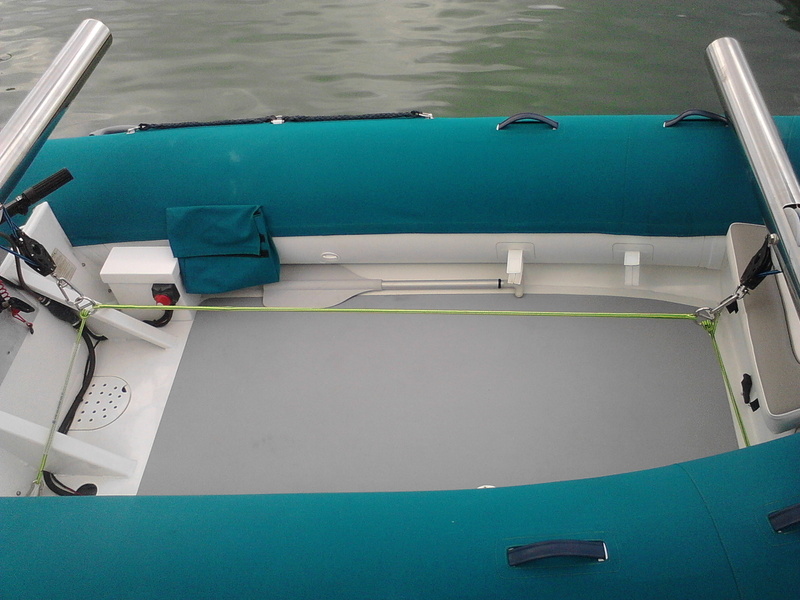 We couldn’t buy one locally because all appliances in Asia are 230 volt, and Sophie is a 110 volt American boat. We had to get a local carpenter to recut the wooden face plate in the microwave cabinet in order to get the new appliance to fit. Hi Dan! Finally, we got new fender covers. I know it’s a relatively minor thing, but it means a lot to us. They look nice! That’s about it for now. Please stay tuned, because later today Jenna is going to do a post an out the most terrifying thing imaginable that happened to us this week. It’s awful!